The United States Mint had ceased striking silver dollars in 1804. Although the denomination was the "flagship" monetary unit in U.S. coinage, demand for it came mostly from bullion depositors, and few dollar coins circulated in the beginning of the 19th century. Much of each year's mintage was either melted domestically or exported. By the 1820s and '30s however, two successive Mint directors, Samuel Moore and Robert M. Patterson, had advocated reviving dollar coinage. Although Moore obtained authorization to do so in 1831, it wasn't until Patterson replaced him in 1835 that preparations finally got under way. Not since the 1792 half dismes were struck had so many Mint and other government officials taken such a keen interest in the production of a new coin. Mint Director Patterson, ambitious to make an artistic statement, hired artist Thomas Sully to make sketches of a full figure of Liberty-along the lines of the allegorical figure Britannia seen on English coins. Patterson retained noted painter Titian Peale to fashion the eagle for the reverse and instructed newly hired Second Engraver Christian Gobrecht to translate the designs to metal. Gobrecht's design was a composite of both Peale's and Sully's works, as well as his own ideas. It was a masterful work and received immediate acclaim. President Jackson and his Cabinet reviewed Gobrecht's sketches on October 17, 1835 and were favorably impressed. The final design featured the figure of Liberty seated on a rock, draped in a loose-fitting gown-suggesting statuary from Hellenistic Greece. She is looking over her right shoulder, her right arm supporting the Union shield. Her left arm holds a long pole with a Liberty cap on top. The entire central device stands alone on the obverse with no stars or lettered devices, only the date below, giving the coin a medallic quality, with Liberty a solitary, cameo figure. A naturalistic eagle in flight adorns the reverse, the bird rising "onward and upward" as Patterson ordered, a position intended to symbolize the unbounded optimism that Americans had for the nation's future. The eagle flies amid a field of 26 large and small stars, representing the thirteen original states and the thirteen admitted to the Union since 1789 (anticipating Michigan's entry). By November, 1836 all was ready for trial strikings in silver. A small number (presumably 18 pieces) of the new dollars were distributed in Philadelphia. Reaction was almost universally positive, with one exception. Patterson had ordered Gobrecht to place his name on the new coin. He did so by inscribing C. GOBRECHT F. in small letters in the field beneath the figure of Liberty-the 'F.' standing for FECIT, Latin for "He made it." Gobrecht was criticized as a "conceited German" and vilified in the local press. Patterson solved the problem by having Gobrecht move his name to the base of the figure of Liberty, visible only if one looks carefully at the coin. The eighteen or so pieces struck with his name below the base are considered patterns and are very rare. Regular production of Gobrecht dollars began sometime in December of 1836. The 1,000 regular issue dollars of 1836 were struck at the old 1792 standard fineness of .8924. The same date was used for the 600 coins minted in March, 1837, but these pieces were produced from planchets .900 fine-as authorized by the Mint Act of 1837. So close in weight, the two issues are easily differentiated by alignment: the 1837 dollars have a medallic alignment-the obverse and reverse are aligned on a vertical axis, while the 1836 coins have a horizontal, or coin, alignment. All original dollars dated 1836 will show the eagle flying "onward and upward," while the restrikes made in the 1850s and '60s will have the eagle flying horizontally. The approximately 25 coins made in 1838 are considered to be patterns, with thirteen stars around the periphery of the obverse replacing the stars on the reverse fields. Only 300 dollars were struck in 1839 with Gobrecht's design, and all were intended for circulation. These coins, like the 1838 patterns, have reeded edges. Throughout the 19th century Gobrecht dollars were very popular with collectors. In the late 1850s, demand far exceeded the available supply. Mint Director James Ross Snowden, desirous of expanding the Mint's collection of coins during his tenure, decided to take advantage of this situation. Funds were not available for outright purchase of coins, so Snowden used Mint dies to create numismatic curiosities such as the Class II and Class III 1804 dollars, "transitional" half dimes and dimes, and Gobrecht dollar restrikes. He would then trade these restrikes and fantasy coins to local collectors for rare coins lacking in the Mint collection. These restrikes were made from 1858 through the summer of 1860 and again in 1867-68. Actual numbers made are unknown, but it is estimated that the total number of restrikes may exceed the original mintage. All Gobrecht dollars were struck in the Philadel-phia Mint and have a proof finish, even the regular circulation issues of 1836 and 1837. 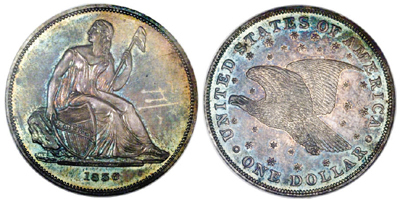 This is a unique phenomenon in U.S. numismatics-the only series of coins intended for circulation struck as proofs. Counterfeits are virtually unknown, perhaps because of the proof surface, which is very difficult to duplicate. The design first begins to show friction on Liberty's knees and breasts and on the highpoint of the eagle's breast on the reverse. Traditionally given the status of regular issue coins, Gobrecht dollars are actively pursued by type collectors. The most commonly encountered issue is the plain edge 1836-dated restrike with name on base and starry reverse. These restrikes comprise more than two-thirds of the Gobrecht dollars offered at auction in recent years, and they exist in a wide range of grades from heavily circulated to gem condition. Date collectors occasionally attempt completion of a three-piece set of coins with the dates 1836, 1838 and 1839, but very few collectors undertake the challenge of a complete set of Gobrechts. Such a set would be virtually impossible to assemble because of the several obverse/reverse mulings made by Mint Director Snowden in the late 1850s. Beginning in 1837 Gobrecht's Seated Liberty design was adopted on all U.S. silver coins from half dime through dollar. The reverse with its naturalistic eagle was dropped for the quarter, half dollar and dollar denominations in favor of a revision of John Reich's heraldic eagle of 1807. The obverse design, only slightly modified from Gobrecht's original concept, was used on the dollar until 1873. BIBLIOGRAPHY: Bowers, Q. David, Silver Dollars and Trade Dollars of the United States, Bowers and Merena Galleries, Wolfeboro, NH, 1993. Bowers, Q. David, The History of United States Coinage As Illustrated by the Garrett Collection, Bowers and Merena Galleries, Wolfeboro, NH, 1979. Breen, Walter, Walter Breen's Complete Encylopedia of U.S. and Colonial Coins, F.C.I./Doubleday, New York, 1988. Julian, Robert. W., "The Gobrecht Dollars of 1836-1838," Legacy Magazine, November-December, 1988. Pollock, Andrew W., United States Patterns and Related Issues, Bowers and Merena Galleries, Wolfeboro, NH, 1994.